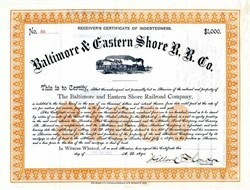 Beautiful $1000 Receiver certificate from the Baltimore & Eastern Shore R.R. Co. issued in 1892. This historic document was printed by John Murphy & Co,. Printers and Stationers and has an ornate border around it with a vignette of a train. This item has been hand signed by the Company’s Receiver, and is over 119 years old. 1886 - The Baltimore & Eastern Shore Railroad Company, organized to build a line of road from Eastern Bay, in Talbot county, to Salisbury, Wicomico county, Maryland. 1890 - . In June, 1890, the Baltimore & Eastern Shore Railroad Company purchased the property of the Wicomico & Pocomoke Railroad . 1891 - In August the Baltimore & Eastern Shore Railroad Company completed the construction of its road from Eastern Chesapeake Bay at McDaniel to Salisbury. 1894 - The Baltimore & Eastern Shore Railroad Company was sold at foreclosure, and reorganized as the Baltimore, Chesapeake, & Atlantic Railway Company. The Maryland Steamboat Company, the Eastern Shore Steamboat Company, and the Choptank Steamboat Company were also acquired. The BC&A was controlled by the Pennsylvania RR. Research by OldCompany.com (old stock certificate research service).